In a little over six years, Facebook has gained more than 500 million users and an estimated value of around $10bn (£6.6bn). But the social networking site has also tied itself in knots over privacy, so much so that German data officials are now taking the company to court. Earlier this year almost 40,000 users said they were going to commit mass-Facebook-suicide rather than continue using the site. Facebook's mop-up operation included what it called "simplified" privacy settings. But has the company reached a crisis moment, where people begin to wonder whether the benefits of Facebook outweigh the costs? Olivier Glassey, a sociologist at the University of Lausanne, Switzerland is critical of the way Facebook treats its users. "We are providing a lot of information and we do not know how this information is used by them or even what kind of information Facebook is processing and how. "So maybe a better balance between given and received information will be a point to work on in the future for the user and for Facebook," he said. While many get peeved with Facebook, most just adapt their behaviour to whatever Facebook throws at them. Nick Molden is a Facebook friend. Originally from South Africa, he and his family have lived in Australia and now France. Facebook is a lifeline to their previous lives. Nick has helped his two daughters set up their privacy settings and says he's less concerned about privacy than how much time his two daughters spend on the site. But if you talk to Nick's daughters, he is actually not that relaxed about privacy, and does a lot more than most parents to keep their lives private. The rules have been drummed into his teenage daughters Kate and Tessa. "We're not allowed to add people we do not know on Facebook as friends and we are not allowed to post pictures that are unsuitable. "He goes through all our privacy settings so that certain photos are only for friends to be able to see. "And our details, like our address and phone numbers, only our friends can see that. And maybe only a certain number of friends in our list of friends can see that." 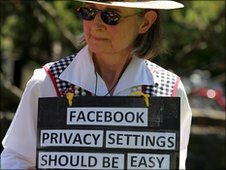 Some families rely on the privacy settings, settings that Facebook changed the default values of in December 2009 so that personal information would be shared with everyone. And in the company's latest "instant personalisation" innovation, "everyone" now includes other websites you might visit. It is a game of privacy cat and mouse that has prompted some users to rebel and others to unconsciously outsmart Facebook. 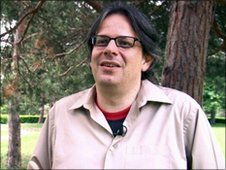 Social technology commentator Laurent Haug believes changes to the privacy settings are altering the way people use Facebook. "People understood that their privacy was at risk and therefore they will falsify the information. It is what sociologists call projecting your life. "You start to manipulate the data, you start to make things better, you start to put out only selected pictures of yourself, because you know that the pictures are going to circulate. "So what we see right now is that social networks are less and less a representation of our life as it really is. It is more what we want others to think our life is, which is a very, very big difference." Fewer of us are putting down our real details, many of us fabricate our lives online and some even have multiple identities on Facebook. There is a real possibility then that much of the personal data Facebook has been collecting from us might actually be false. Facebook's future could be complicated. Its business model is under challenge from data commissioners in Europe, where personal details are protected by law. And while users are far from leaving Facebook in droves, they might think twice if something like Diaspora works out - a social networking site currently under development that aims to put privacy at its core. Mr Glassey believes there is room for alternative solutions. "[Diaspora] sees the real possibility of trying to provide more ethical solutions and build from scratch a user-only platform which will protect different kinds of privacy. The key issue is the critical mass that you need to gather to be a viable alternative." Diaspora is just one of a growing number of social network start-ups, which includes OneSocialWeb and Appleseed, that want to steal some of Facebook's audience. In early July, German data protection officials in Hamburg announced the start of legal action against Facebook, accusing it of gathering data belonging to non-Facebook members. Switzerland is also pondering action. If found guilty, the firm could face fines of tens of thousands of euros. Pressure is gathering for another public relations revolt against the social networking giant. If data drilling is your game, then your core asset is trust. If that disappears and there is a competitor to defect to, then the result could be a leak of users you will never be able to plug.